I replied to your email Johncy. If you can get me a set, I'll help that dream come true. Anyone have a pair of stock XJL SC cats laying around? considering making any for S-type/Xf 4.2L? Yes, I am planning to offer options for the entire line-up. If someone is willing to send me the stock catalyst I will build a set for any particular model and discount it. Looking good Derek any progress on the headers at this stage ? I'm following up with Kenny tomorrow to see about getting the car in the shop to start the build. He was finishing up a Can-Am replica build last month that was taking all of his time since it was such a costly build. If He isn't finished I may go ahead with the build myself. My plan is to not matter what, complete the 4.2 header build in a month so that I can move onto the 5.0L XKR. Additional Note. I'll post over in the XF section. I picked up an XF 2010-2012 model to start building products for as well. Starting with Cats and X-Pipe. Possibly full exhaust. 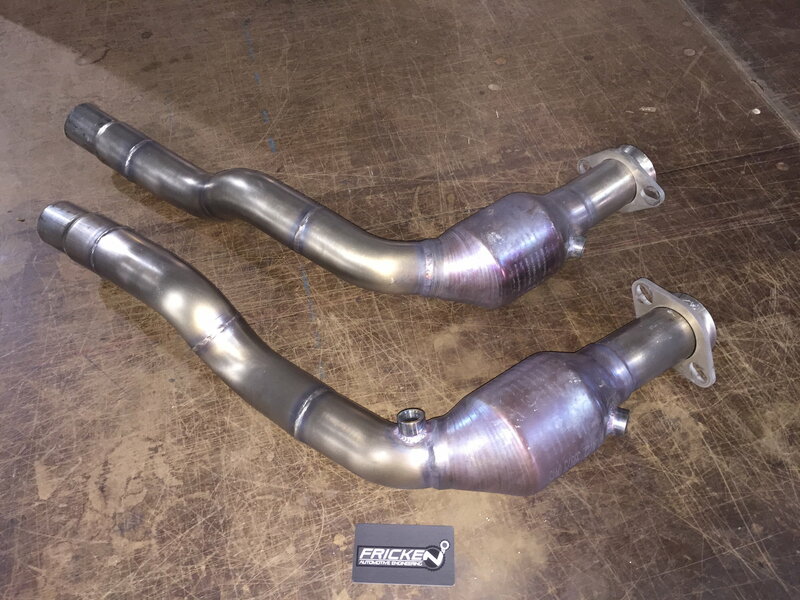 5.0 XKR High flows ready yet? I'm ready to build a set, just waiting on someone to send some in to replicate. I picked up an XF to design setup for along with some other parts but have not picked up a 5.0L XKR as of yet. If anyone is willing to send their stock set in for me to scan and build a fixture, I'll toss in a 50% discount on their purchase. Plus a discount on engine carbon that will be released shortly. Are these test cats still available? A lucky local member here in Charlotte snatched these up. Maybe I missed it but do you have any before and after audio? I would like the performance gains from your cats but I have been told by several people I know that my car will sound like a Mustang and no longer a Jag. Thank you. 100 cells certainly do open the volume up a little. The 200 Cells are not to shabby with stock muffler. We are working on getting some sound clips of stock vs. modded as well as back to back dyno numbers. We will try to get dyno numbers shortly with the stock muffler system. I have base dyno data on a 2008 XKR, I just need to mount the factory muffler back up for a pull with the 200-cell cat. This test-mule has a 3" system and soon to be headers for the whipple project. Here is a clip of the 3" setup. I have a few clips of a local member that has Borla mufflers and the 200-Cell I can upload as well. Mine is a 2008 XKR as well. I have the stock rear box with the valves open at all times. I replaced the 2 resonators with an X-pipe so there is a nice burble, snap, crackle and pop and sounds like a jet engine on a dyno at 5000-6000 RPM. I would think torque increase would be pretty decent with 200 cell cats. The video you posted sounds good although affected by the structure surrounding it. I may be interested. Let me know what you find out with the stock box fitted. Thanks! I'll see if I can get some additional video/sound clips in the next few days for comparison. The deceleration crackle and pops are quite awesome with the 200 cells. Especially that sweet spot when you have a little in the throttle. Additionally One perk to the cats is if one desires, I can weld in v-band clamps for a quick cat delete removal if desired. A small increase in price to do so, but if one desires, its a great track day option. I'm going to do this with the header kit I'm working on and test a variety of collector and cat options. Also it should be noted that it is possible to delete the O2 sensors in an ECU remap. Did an additional vid out in the open away from any obstructions. Let me know if you would like to hear any other variations Jahummer.